Facial Swipes for Grubby, Temperamental Skin. I’m not a great believer in face wipes, but these are face swipes, not face wipes, and that makes them a-ok. I jest of course; but there’s far more to this little packet of beauty tissues than just a jazzed-up name. For a start, they’re nothing like your run-of-the-mill wipe; some of the versions out there are just hideous. Quite handy for when you run out of loo-roll, or if you need to clean your makeup brushes on-the-go, or if you want to make it look as though you’ve cleaned the bathroom when unexpected guests come over, but for face care? Nah. Not on a regular basis, anyway. Mama Mio’s new Gorgeous Glow Balancing Facial Swipes are nothing like your usual wipe, though; not laden with harsh, drying ingredients or stripping cleansing agents. They’ve been formulated for delicate, temperamental pregnancy skin and are infused with aloe to soothe, antioxidants to protect and a blend of oils to help moisturise and nourish the skin. What I find interesting about these swipes is that they’re not all namby-pamby; they’ve been designed to give the skin a really deep and thorough cleanse (as much as a wipe can do that) and they have lactic acid to gently exfoliate and keep blemishes in check. A nice emergency option, then, for anyone with hormonal or temperamental skin. Breakouts with sensitivity, breakouts with dryness, grubby PMT skin, grubby festival skin, grubby mid-flight temperamental PMT skin… You get the picture. I decided to do a bit of a test with these last week; I wiped my face all day with Gorgeous Glow swipes and didn’t follow up with any moisturiser. (Crazy! I know!) With pretty much any wipe I’ve tried previously, my face would have been almost inside-out with dryness – these? A great feeling of freshness and cleanliness but with absolutely no dryness. Wonderful. 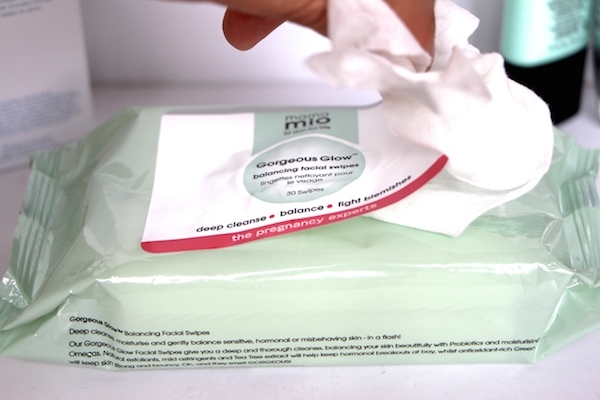 I’d never recommend a wipe as your main cleanse, just because I think that it’s a good habit to be going in there with something more substantial and then rinsing all of the residue and crap away with water, but when it comes to emergency cleansing these are brilliant. The packet says to avoid the eye area; I didn’t, because I’m a daredevil like that. My eyes didn’t fall out or anything but you’d probably want something different to take your mascara off with. 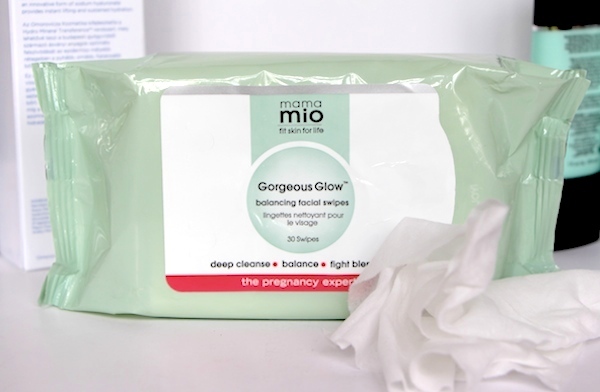 Mama Mio Gorgeous Glow Balancing Facial Swipes are £14 for 30 wipes with free delivery here.